Lebanon High School teacher Andrew Gamble leads a discussion on the presidential campaign. The presidential campaign is usually an opportunity every four years for students to study democracy in real time. But, by all accounts, this campaign has been anything but normal. The adult themes and harsh rhetoric have been especially challenging for educators, who’ve had to figure out how to address these subjects in the classroom. NHPR Morning Edition host Rick Ganley spoke with educators across New Hampshire to see what’s different about teaching the presidential campaign this year. In a classroom at Lebanon High School where the walls are covered with political memorabilia, teacher Andrew Gamble is leading a discussion on the presidential campaign. He plays clip from a recent Donald Trump campaign rally: "I’m just thinking to myself right now, we should just cancel the election and just give it to Trump, right?" Gamble asks the students for their reaction; there’s agreement that while Trump may have been joking, the remark feeds into a dangerous narrative. “If you asked any one of those people in the crowd, ‘Would you like America to be a dictatorship?’ they would probably answer of course not or no. But what he just described there, that’s a dictatorship," says senior Nick Brandt. It’s conversations like this which Gamble says makes teaching this presidential campaign unlike any other. Then there was the Access Hollywood tape that caught Donald Trump talking in vulgar terms about women. Gamble chose to play an edited version in class. "We do send out a permission slip saying we’ll be dealing with adult content in this class," Gamble said. After watching the video, Gamble and a female teacher split up students by gender, and met with them in two groups. He says the boys admitted to using some inappropriate language at times. Political memorabilia covers the walls of Andrew Gamble's class at Lebanon High School. Across New Hampshire, educators agree this election has forced them to think differently about how they bring the presidential campaign into the classroom. “It’s not something we’ve ever seen before," says Greg Leonard, who has taught government at ConVal Regional High School in Peterborough for more than 20 years. “Because generally speaking, politics can get pretty nasty and down and dirty, but this year it seems like it’s at a different level and a different pitch." So, what do you do when the content of the campaign is something traditionally reserved for mature audiences? Leonard says you just have to take it head on. But, it’s also been an opportunity to dive in to new topics. Students in his class spent time exploring the tradition of a peaceful transfer of power after Trump said he may not accept the outcome of the election. But there are teachers who say they’ve avoided some lessons because of the campaign’s tone. Like Cynthia Young, who teaches social studies at Portsmouth High School. But students are still learning about the campaign, and Young says the discussions have remained civil. Portsmouth High School had its own controversy this week, when a teacher was removed from the classroom after dressing up as Donald Trump and dancing to an expletive-laden song in front of the class. Greg Leonard, the teacher at ConVal, says the heightened attention on the race brings added pressure on educators to not let their own personal politics seep into the classroom. “I always ask my students at the end of a government class which political party they think I belong to. And I know I’ve done my job right if a third say I’m a Democrat, a third say I’m a Republican, and a third say I’m undeclared. For teachers like Evan Czyzowski at Sanborn Regional High School in Kingston, the goal has been to turn the negative tone into a learning opportunity. Students at Lebanon High School discuss the presidential campaign. For the most part, Czyzowski says the class has gone on as normal: students are playing the roles of candidates and running campaigns, leading up to the school’s mock presidential rally this week. But as for how students are reacting to this unusual campaign? Back at Lebanon High School, students here say they’re not sure what to make of this election. Olivia Smith is a senior. Most of the students here say they’re supporting Clinton, but some say they’ve tried to understand why so many people are backing Trump. That’s why senior Emily Bourne went to a Trump rally earlier in the campaign in Claremont. A Laconia High School English teacher has been named the state’s top educator. 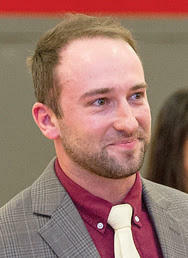 Tate Aldrich was named the New Hampshire Teacher of the Year at a surprise ceremony at the school Friday. Aldrich has been teaching English for eight years, all of them at Laconia High School, which also happens to be his alma mater. Tate Aldrich joined NHPR’s Morning Edition to talk about the award. What was your reaction when you learned you won? Nationwide, many smaller institutions are struggling to survive due to dwindling enrollment, rural locations, and doubt about the inherent value of a liberal education. 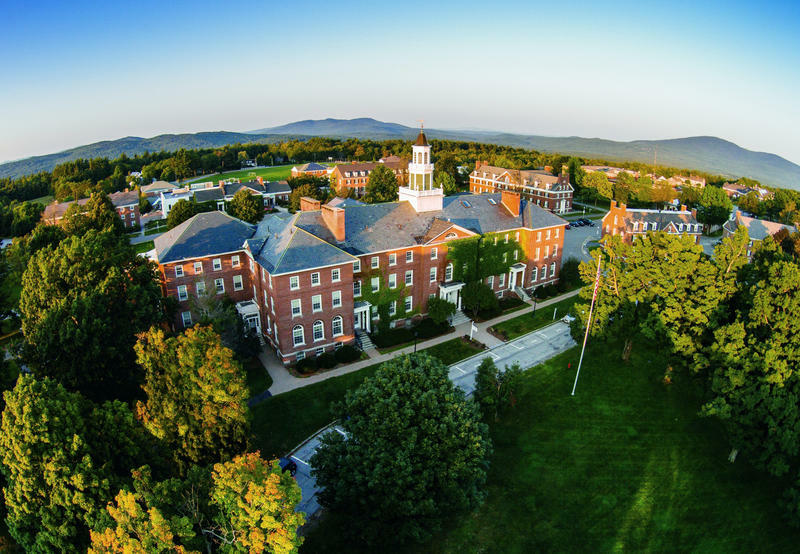 We talk with two New Hampshire college presidents to find out how they're facing these new economic realities and an uncertain future. Scott Carlson, Senior Writer with the Chronicle of Higher Education. Dr. Kim Mooney, incoming President of Franklin Pierce University. She is a Franklin Pierce alumna, formerly Provost and Vice-President for Academic Affairs, and served on the board of trustees of Franklin Pierce College. Dr. Susan Stuebner, President of Colby-Sawyer College in New London, N.H. She took office July 1st. Previously she was Executive Vice President and Chief Operating Officer at Allegheny College in Pennsylvania.